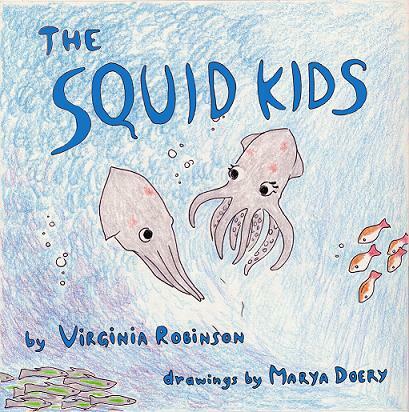 The Squid Kids is a children's book written by Virginia Robinson, with illustrations by Marya Doery. THE SQUID KIDS tells the early experiences of Suzy and Sammy Squid as they learn a variety of survival skills: catching small fish for food, skimming over the water's surface, and eluding large predators using a jet of dark ink. As brother and sister learn from each other, the underlying message becomes clear: "Give a man a fish; you have fed him for today. Teach a man to fish and you have fed him for a lifetime." For ages four and up, and maybe for precocious three-year-olds. This picture book is now for sale from PublishAmerica. Watch for more news here and at our blog! You can also add the RSS for our blog to your RSS feed reader. We hope you enjoy our book and this site! Check out the new memory game!